"Cause I asked you. Because you like me. You fancy me. But having me is nothing. Any prick can have me." Leonardo Di Vinci's Mona Lisa embodies many questions with few answers. Many have stared at the face, at her mysterious eyes, at that slight smirk upon her lips, and wondered what secrets and passions her half-hooded gaze hides. That is the power that his famous painting possesses. As Neil Jordan's film of the same name opens, we watch a shabby, squat man walking purposefully through London, his poorly-fitted clothes out of date, a package under his arm, flowers in his hand, and a look of determination on his face. Across a bridge and through a park he arrives at his destination, a nondescript door to a nondescript house in a nondescript lower middle-class neighborhood. A young teenaged girl in a school uniform answers the door and they stare at each other, recognition on his face but not on hers. The moment is soon shattered when the girl's mother runs screaming to the door, slamming it closed over both his and the girl's physical and verbal protests. The girl has realized too late that the man is her father. This is the man's welcome home after seven years in prison. Recognizing that his personal life is in shambles, he focuses his attention on getting his professional life back in order. We never know exactly why this man, George, went to prison, but it becomes abundantly clear early on that it had something to do with his previous involvement with a vice boss named Mortwell. George goes to see Mortwell, looking to be "taken care of" (i.e. given a job) and he is rewarded with a beeper and the task of driving around and looking after a prostitute named Simone. Simone is a high-priced call girl who keeps appointments in a variety of luxurious homes and West End hotels. To say that George and Simone don't hit it off at first is a massive understatement. Despite her elevated clientele, to George she is nothing more than a black whore and therefore beneath him. He is incredulous about the condescending manner with which she treats him. Simone, on the other hand, is embarrassed of this buffoon whom she must work with, his uneducated mannerisms and his dreadful clothing that make him stick out like a sore thumb in the lobby of the Ritz-Carlton and the other locales wherein she plies her trade. It comes as little surprise that the animosity does not last, and evolves first into familiarity and professional courtesy, and then into a friendship of sorts. George discovers a sadness and passion under her elegant exterior. Simone discovers a kind heart and rather significant naïvete (due to his many years away from the changes society has undergone) under his brazen and gauche mannerisms. She confides in him, sharing the reasoning behind their nightly ritualistic visits to London's seedy and dangerous King'sCross neighborhood on the way home. She is looking for someone, another prostitute that she'd walked these streets with in the past. Simone escaped to a safer, more elegant life, away from physically abusive ponces (pimps) and drug addiction. Her friend Cathy, young enough to still be in secondary school, did not. At one time, Simone had promised to take care of Cathy. Now she hopes to find her and make good on her promise. She cannot venture too far into her old world looking for her, though, as her old ponce still wishes her great harm for walking out on him. George, she knows, can, and she uses their new friendship, and the fact that Cathy is about his daughter's age, to convince him to do so. Little does George know that his decision to help Simone find Cathy will evolve into far more than just a casual search for a missing prostitute. Mona Lisa is most definitely an actors' film. Bob Hoskins, in particular, makes this film with his perfect, leveled performance. For this, he was rewarded with a Best Actor win from both Cannes and BAFTA, as well as an Academy® Award nomination. As it happens, Neil Jordan originally had Sean Connery in mind, but he proved to be unavailable at the time that Jordan wanted to begin shooting. Hoskins liked the screenplay but had reservations about how the main character was written, so Jordan rewrote the screenplay with him in mind. Almost as impressive as Hoskins is Cathy Tyson (niece of actress Cicely Tyson) in her first film role. This was a big bite for her to chew on her first trip to the table and she does so admirably. Michael Caine is competent as always as the sleazy and sinister Mortwell, whose involvement in the story becomes more pronounced than one would initially expect. British comedian Robbie Coltrane fills in as Thomas, George's best friend and confidant who helps him back onto his feet after his return from prison. The interaction between George and the rather eccentric Thomas provides most of the film's moments of levity. Irish-born writer/director Neil Jordan's impressive career has featured both smaller, acclaimed films (The Crying Game, The Butcher Boy) and mainstream thrillers (Interview with the Vampire, In Dreams). Produced by Handmade Films (George Harrison's production company), Mona Lisa marked Jordan's real stepping out. The film operates as a character-driven drama, a thriller (particularly in its second half), and a brutal expose of the darker side of London. His dark, decadent tour of the city's seething underbelly is not one we will find in any travelogue. Like Jordan's The Crying Game, Mona Lisa had a bit of a delayed impact for me. I was most absorbed in its details when watching it, especially the overall quality of its performances. However, it still occupied my thoughts hours later, my overall impression of the film becoming more favorable as I relived it in my mind. Image Transfer Review: Filmed on 35mm stock and presented in the 1.77:1 aspect ratio, Criterion's release of this film features a letterboxed, nonanamorphic transfer. On the plus side, this is a very clean print of the film with minimal blemishing or dirt present. On the down side, the heavy graininess of the original image is readily apparent (most especially during the opening title sequence), even from normal viewing distances. Colors tend heavily towards the muted. While blacks are deep (crucial in a film like this where so much of the action takes place after the sun goes down), shadow delineation is poor and a few instances of mild artifacting can be seen on camera pans across surfaces. Overall clarity of detail tends to be about average and some edge enhancement is noticeable. Audio Transfer Review: In the past few months, I have reviewed several films that featured a digital mono audio track. This is not one of the better ones. Even for a mono track, dynamic range is very limited with sounds parked almost exclusively in the middle range of the sound spectrum. Hoskin's heavy Cockney accent aside, dialogue is more or less clear but substantially lacking crispness throughout. Additionally, some minor volume level shifts occur but they don't tend to be too distracting. Only the music comes across with any substantial fullness. 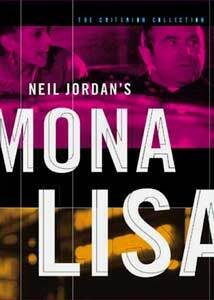 Extras Review: Mona Lisa features a joint commentary with director and co-writer Neil Jordan and actor Bob Hoskins. The comments from each were recorded separately and spliced together to form one running presentation with only minimal gaps. Hoskins is particularly entertaining and frank, contributing several candid remarks and a humorous story about the first time he met Michael Caine. Jordan, his mind operating on a more literary level, will never be accused of being the most exciting commentator in the world but there is some very interesting stuff to be gleamed from his voiceover for fans of the film. He is at his most interesting when speaking of the trials and tribulations of making the film itself. Despite some astounding performances in the lead roles, most particularly from Bob Hoskins, Mona Lisa failed to draw me in quite as successfully as I had hoped and expected to. Even if your experiences in this regard are like mine, this remains an unforgettable film and definitely worth the effort.